Pretty Bookstore, by Rob Ketcherside. Lutton’s passion for books is infectious. On a busy weekday morning she swoops around corners and rattles off quotes from Dickens, Shelly, and Blake. No doubt that passion is partially responsible for the lasting success of Twice Sold Tales. Last weekend Lutton celebrated the shop’s 25th anniversary. An impressive feat for any Capitol Hill business, let alone a used bookstore. Lutton has been able to stick it out when so many other book vendors haven’t. “Stubbornness. I refuse to die,” Lutton said. February 17th marks Twice Sold Tales’ official anniversary. That was the day in 1988 when Lutton said she was scolded by a city official because she didn’t have a vendor’s license for her burgeoning book cart business. So she set off for city hall and became a licensed seller that day. After outgrowing the carts, Lutton expanded to her first brick-and-mortar store in July 1990. The Broadway and East John St. location was a Capitol Hill fixture for nearly two decades and became a neighborhood-defining store. In 2008, the store moved out so the building could be leveled to make way for the Broadway light rail station. After securing the Harvard Ave location and putting in 7 months of non-stop work, Lutton and her six cats settled into their new, more spacious home. Lutton said she has no plans to expand or open new shops, despite her previous attempts. She was a minority owner in the Queen Anne and University District stores – both are now closed. The downturn in the economy, mixed with aggressive property buyers, and one too many handshake deals made the ventures no longer viable, she said. One promising new venture could include shipping to less saturated used book markets in Australia and New Zealand. Lutton has six years on her current lease, and plans to sign another one when it’s up. “I want to be here for a long time,” she said. She remains optimistic about the future of independent booksellers and the demand for real paper reading in the age of Kindles and e-books. To commemorate the anniversary Lutton ran yet another one of her generous sales. If you missed it, don’t worry: Her 25% off sale after 6p is the best every-day-of-your-life book deal on the Hill. Lutton is also in the process of writing her own book. Not surprising, it’s about books. No details she’s willing to reveal yet, other than she’s halfway done. And it’s a good thing. You can be sure, even if it’s published 25 years from now, there will be a paper version sitting on the shelf of some independent bookstore to carry on the legacy of Lutton’s work, and no doubt imploring you to read more Blake. I can’t count the number of times I’ve randomly decided to walk to Twice Sold Tales to say hi to the cats and see if any books can tempt me into breaking my constantly broken rule of not buying any more books “this year”. Jamie is always very interesting to talk to, has recommended me several good books, and has been directly responsible for at least 2 of my favorite gifts that were purchased out of her rare/fancy book cabinet. Her and her store are part of why I love this hill. The vinyl metaphor isn’t quite perfect. When you listen to vinyl, the weakest link is the needle/cartridge making contact with the record. When you listen to a CD, the weakest link is the fact that it has been digitally processed and the sound has very slightly changed as a result. This is why stuff like SACD exists — to digitally process at ridiculously high (but still not loss-less) rates. For this reason, the vinyl vs. everyone else debate has some technical merit directly related to the quality of the product. Books, on the other hand, don’t really play that game to the same degree. I would argue the reader’s experience is not made significantly better or worse by using an e-ink based reader over a dead tree. Each medium has some pluses — e-ink: small, storage, searching, networked purchases; books: cheaper, no DRM, easier to write on, no battery, much less likely to get ruined or stolen. But at the end of the day it’s not like DVD vs. Blu-Ray where the picture and audio is just obviously much better. Dead trees are holding their own against e-books. I have told everyone I know who habitually buys…. me gifts not to buy me an e-reader. I would have 3 if I hadn’t taken these preventative measures. Over the years I have slowly been dropping physical media from my life. The music was first to go in the 90s. I ripped all my CDs to mp3s and sold them right around when consumer CD burners were first hitting the market. A few years later, before Blu-Rays existed, I did the same thing with all my DVDs and turned them into Xvids. I still have all my digital copies of those albums and DVDs, but am pretty sure that didn’t quite fall under fair-use. I don’t own a single record, CD, DVD, or Blu-Ray other than maybe 10 console games. Everything is digital because I am a nerd and it’s technically better — I can play any audio or video file on any piece of audio or video equipment I own because they are all networked together. For computer software, I can safely store the licenses and go download my copy of OSX or Windows or Office straight from the source and not have to worry about keeping the stupid boxes. Although I’m not a huge gamer, I got rid of all game boxes, turned them into digital copies and, other than the occasional console game, all future game purchases are digital. I have all my contacts, calendars, notes, and personal information on my phone and iPad. I have 3 LCD picture frames. I use 1 drawer of the smallest file cabinet you can buy at Office Max and could probably throw out all but 100 pieces of paper in it. All of my bills are paperless and I signed up for the 10 year “don’t mail me crap” program, so I get about 5 pieces of mail a week, if that. In almost every way, I have jumped to the land of the digital. But I’m taking dead trees to the grave. At this point I am occasionally having to justify my room of packed shelves as art when people ask me why I don’t own a single CD or DVD but don’t have an e-reader. Books are the one dated, analog medium that were designed well enough to not be obliterated and churned by the world of the digital and I’ll stick with them for the foreseeable future. Stores like Twice Sold Tales and people like Jamie help me with that plan. PS: yes, big time nerds, I accept that hard drives are still technically a form of physical media, but we both know the comparison gets into apples-to-oranges territory fast when we think about, say, Dropbox. Any business owner and manager can learn something from Jamie in regards to how every person who walks through their door should be treated. I have only been to her store a few times and have met her while out and about. She is a class act and I would encourage anyone purchasing a book to check her store first. I trade and buy my books at Twice Sold Tales and have for about 15 years, so has my husband. Sometimes I just go in for a ‘cat fix’ and to donate to their food fund, but inevitably end up having an interesting conversation with Jamie (she is very informative!) AND looking through the books for a mystery I haven’t read yet. ALWAYS find at least one. 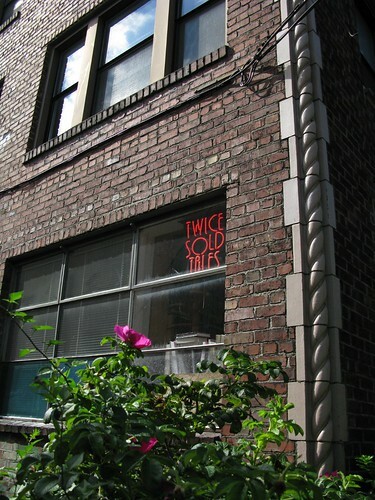 We have always enjoyed Twice Sold Tales and also want Jamie and her store around for a long time. If I go to a store and ask to buy a particular item and they tell me to buy something completely different, out the door I go!. I remember when she operated just a book cart. Congratulations and thank you for your quarter century service to the “bookies” of Cap. Hill. It’s a BOOK STORE. A USED BOOK STORE. They’re set up for browsers, adventurous people with some time to spend and the hope of finding something wonderful. One might not find the thing they’d been looking for, but might find something just as good or better. It sounds like the online model of buying things (decide what you want, then buy it) might suit you better .. the dying art of browsing is taking local businesses with it when it goes. True, those stores, under the Twice Sold Tales name, are no more. 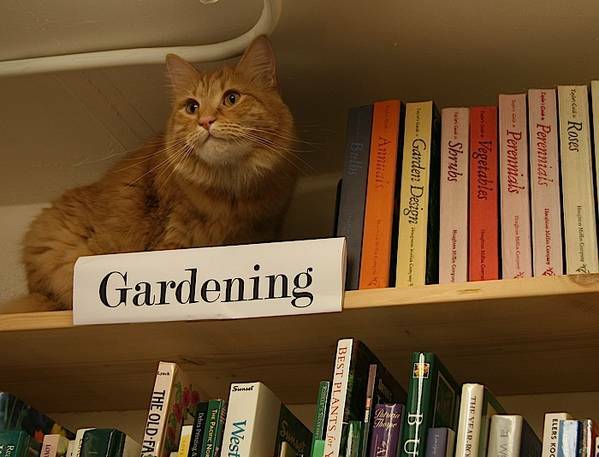 But that Queen Anne location still exists as a used bookstore, one owned by a former TST employee. The Univ District one closed as well, but I believe he put his remaining inventory online and basically accepted a chunk of change so that Chase bank could move into the corner location. Used book selling is not dead and TST CH isn’t the only game in town. It would have been nice if you had also included quotes from some of the many employees that TST CH had throughout the 25 years. They’re pretty full of stories, which is understandable when one works for a character like Jamie.